Three items are on my radar this week. My favorite comic of the DC new52. I finally received all my issues via mail order this week. (I order all my comics this way as there’s not a good local shop nearby.) Reading #3-6 in a row made me realize something. This is essentially the same Barbara Gordon she’s always been, right down to her not-always likable trait of refusing to accept help and going her own way. Her need to prove to herself that she can be a hero again despite the trauma of her shooting and her recovery from paralysis is the driving force behind this book. I loved seeing the progression in the first six issues, not only in her abilities, but in her letting other people in, even slightly, emotionally. I wish this book was number one in sales and then DC could just have James Robinson write The Shade forever instead of writing other stories that I don’t like. The Shade, for those who aren’t familiar, is an immortal anti-hero who’s no longer quite human but somehow composed of some type of inky darkness. He appears human but his body isn’t. He had a supporting role in Robinson’s wonderful Starman series, one other miniseries, and now this miniseries. Because The Shade is immortal, we often get stories throughout history, but with twists, such as vampire pirates. The Shade’s driving force in this story is to find out who wants him dead or captured and that takes readers all over the world and into his past lives. GeekMom interviewed artist Fiona Staples recently and the early reviews of this series have been spectacular. I’m looking forward to the first issue of this galactic, war-torn tale of lovers trying to hold their family together. 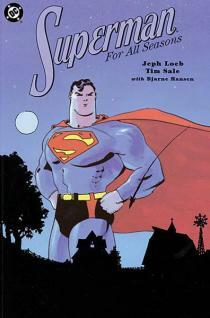 This past week I picked up the DC Graphic novel “Superman for All Seasons“. When I first saw the novel on DC Comics must read list, I was a little skeptical. I was guilty of judging a book by its cover (or more so, a comic book by its art). The art was beautiful, but it’s a totally different style than how you see the Man of Steel drawn today. I was hooked in the first few pages where it starts off at Superman’s beginning. The story leads you through the four seasons and you see how Superman changes in Smallville and Metropolis. The action was minimum and nothing intense. Instead of seeing him fight a particular villain, you see him struggle with himself and who he is. Lex Luthor is the main villain, and I saw him as more of a nuisance than anything else. I love Lois’ spunky attitude in the story. Overall it was a great story and a nice relaxing read. I finally got my digital mitts on Justice League International #7 and all I can say is…wow…It only took 7 issues to kill off what seemed like a few major characters. In the first two pages two members of the team are in hospital beds, two of the founding UN employees and one JLI member are discovered to be dead. The ending was just as much of a cliff hanger as the previous and it introduced a new character, Batwing. I don’t know anything about this character so I am interested to see how he fares in helping Booster Gold fight the new villain Lightweaver. Mass Effect 3 released last week, so it’s the perfect time to catch up on the Mass Effect comic series! Thanks to Dark Horse Comics, I was able to get my hands on a preview copy of the Mass Effect Volume 3: Invasion trade paperback coming in April. The collection includes all of the Mass Effect: Invasion series, along with the short comic Conviction, which was previously only available online with a special code from comic retailers. Mass Effect: Invasion follows the action on Omega, a space station players of Mass Effect 2 are well-acquainted with. Aria T’Loak is the ruthless, powerful leader of Omega and she fights an invasion of alien monsters with no holds barred. The story is fast-paced with references to military history and strategy that gives a sense of the larger conflict about to begin. Mass Effect: Conviction is an introduction to the character James Vega. An Alliance solider with a dark past hinted at in these few pages, Conviction makes me more interested in getting to know him in Mass Effect 3. These stories are a fantastic tie-in to the last installment in the Mass Effect game series and add even more depth to the game. Mass Effect Volume 3: Invasion will be released on April 2, 2012 by Dark Horse Comics. ← Are You Watching Lilyhammer? WOW great article. Of course as Dakster’s grandmother I am thrilled with everything she writes. As a kid, a long, long, long, time ago I loved comic books. It was a great way to disapear into a world of fantasy and adventure. Any comic books you can recommend for a 10 yr old girl? Are there any DC lines that really are kid friendly, I know they can get pretty rough. We have several Batman /Superman , Green Lantern, Batman, etc , but none of the graphic novels we have are really kid friendly. I have reached out to DC and Marvel for more suggestions. I will post up once I hear back from them. 🙂 I plan on featuring some kids comics in the near future because I am finding this is a common question from parents. Thanks for reading! You might want to check out the trade paperbacks of Bryan Q. Miller’s Batgirl run, starring Stephanie Brown. And the Marvel Adventures line from Marvel has a lot of familiar heroes and is age appropriate. My local comic book shop suggests Batman the Brave and the Bold, Tiny Titans as well as the upcoming Superman Family Adventures series (in stores May 30th). Hope this helps and good luck!